While every month we open magazines to new style rules, new orders of fashion, the truth is we're all different. While a 6'1" size 6 girl may look amazing in floaty, white dress, I am far too pale to pull off white and far too curvy to pull of anything loose. And while high-waisted is my style of choice, it's not always flattering on other body types. Learning what does and does not work for you is a long, laborious and often embarrassing task. We all make mistakes. And while I can pretend I am a complete fashionista, the truth is I make mistakes all the time (which is why you don't get outfit posts every day, mwahaa). I'm still learning what does and doesn't suit my body, my style and my personality. But the more you learn the less mistakes you make in the future (or at least you'd hope so!!). Here are a few things I've learnt about my self after making many, many mistakes. This refers to both clothes and shoes. I have lost count of the number of times I have gone out in a pair of my mum's shoes and convinced myself that although she is a size smaller than me that they fit. I have lost count of the number of times I have come home with bleeding feet. And just because a skirt zips up, it does not mean it will look good. Over-hang is not a good look. Just because your feet don't hurt at the start of the night it doesn't mean they won't be aching after a night of dancing til you drop. That walk to the taxi rank will be the longest of your life. And next time you think about taking your shoes off to walk home, think if you'd eat something you dropped on the pavement when you were sober. I love red lipstick, but I also love dark eyes. I think I've finally found a balance between the two, but there were a lot of times when I thought I could pull it off...only to find Chuckles the Clown staring back at me in the mirror. I'd love to be one of those girls in an oversized shirt and leggings, or in their boyfriends clothes. For me, oversized clothes equals oversized look. Not one I'm especially fond of. For some people, they can look amazing. For me? They make me look pregnant. With triplets. At 9 months. Don't ask why, but my legs are always covered in bruises. I think I just walk into things. Bruised legs are not a good look. Cleverly concealed under light, sheer tights though and you'd never be able to tell my legs aren't a lovely golden brown. I have a habit of rewearing clothes I have that are at least a size too big, mainly jeans, shorts and skirts I love too much to replace. Not only is having to constantly yank things up not especially attractive (have you ever noticed there's no good, or subtle, way to pull up your jeans?) but falling-down bottoms can make you look big enough to fit in them. This is my personal opinion at least. I am over-dressed for life. Being over-dressed can make you feel uncomfortable at first, but if you wear it with confidence you'll be the best-looking person in the room. If you always wear something that makes you feel good you can't go wrong. My style is always developing. When I think I have it down, I'll create something completely new and fresh. I like to feel "me" in whatever I wear, but I'm learning to let myself go and experiment with things that I wouldn't normally consider. Don't get too comfortable or stuck in a rut with what is "you" and what isn't. Fashion is constantly changing and evolving, and you should evolve with it. This may sound contradictory faced with what I said above, but finding your own style is a unique and fantastic experience. While I always want to try new things, I know who I am and my style reflects that. Have fun with fashion but stay true to who you are. Never wear anything that makes you feel uncomfortable, not matter how in style is it. You are who you are, and you will always be in style. 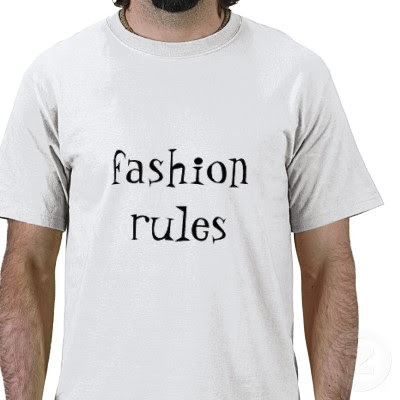 These are great fashion rules to live by! I love the first one about getting something on. There's a thin line between "fit into" and "fits right"
Great rules! Thanks for sharing.